If you like warm food, George from AntiGravityGear is probably someone you are familiar with. One could say that he is the inventor of the pot cozy, that useful bit of kit which keeps your food warm on any day. AntiGravityGear has more to offer than pot cozies, though, and to find out how the company started out and where they are headed, read on! George, please briefly introduce yourself and tell us who you are. Since when are you backpacking, and how did you start? How often are you out backpacking nowadays? My name is George Andrews of AntiGravityGear, LLC and my trail name is Tin Man. My wife Carolyn and I live in Wilmington, North Carolina where I retired in 2006 after a career as an air traffic controller. I am also a commercial pilot and aircraft mechanic. I have 3 grown sons who all backpack. My love of backpacking started in 1973 in the Gila Wilderness Area of New Mexico while in the Army and stationed in nearby El Paso, Texas. Being bored with barracks life, a friend suggested we go backpacking for a weekend and that first hike hooked me for life. We would go backpacking and fishing whenever we had a long weekend. Even back on those early hikes I started thinking about how I could lighten my pack load and kept a journal of everything I carried and the item weights. If a piece of gear didn’t get used or could be replaced with something lighter and better, it stayed behind for the next hike. There wasn’t a lot of guidance around back then so we did things like cut the handles off our tooth brushes to lighten them but then would carry a SVEA123 stove and fuel which weighed a ton! I still keep a journal of my gear whenever I hike. I guess no one gets to go hiking as much as they want but I try to make it out for one big hike of 2 to 3 weeks and several shorter excursions each year. Ironically, I have never hiked less in my life since starting a backpacking related business because the busy season is when I need to be in the shop. Go figure! 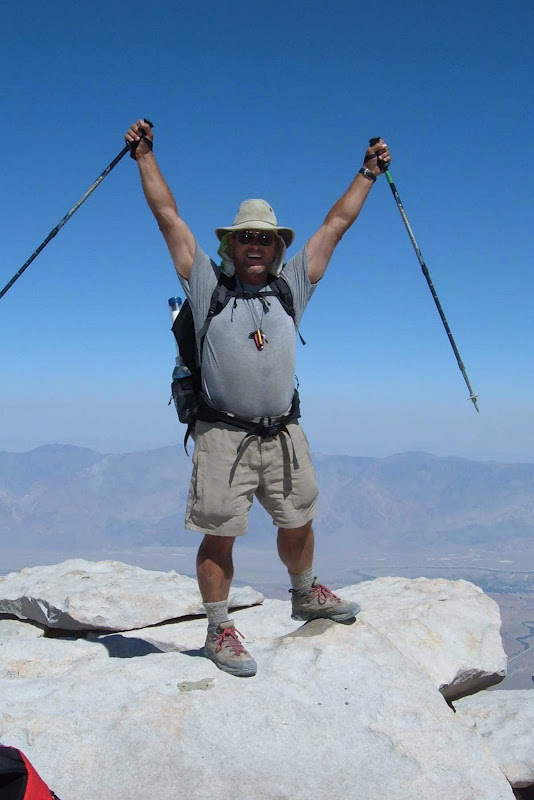 George on Mt Whitney with his 12.39 base pack. I consider myself more of a lightweight backpacker. My typical base weight is in the 15 to 17 pound range. 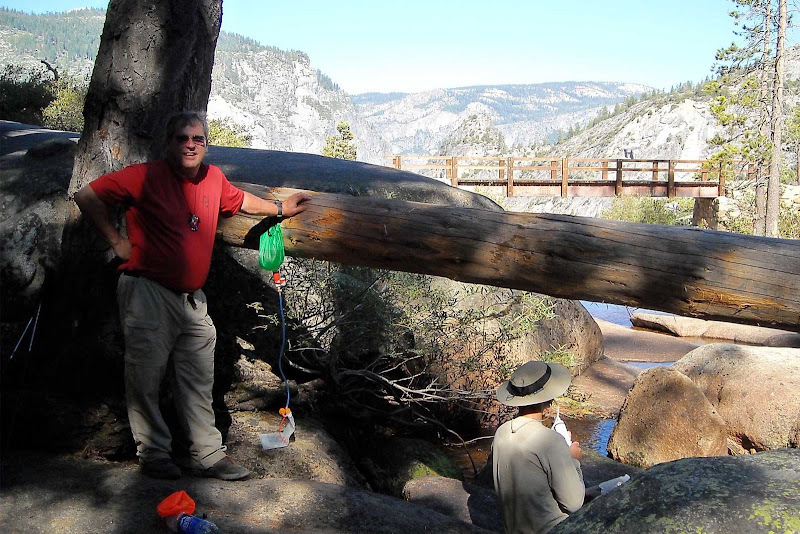 My retirement gift was a hike of the John Muir Trail and my base weight for that hike was 12.39 pounds. I tend to pay more attention to the grams and ounces on the longer trips and tend to take more luxuries for the shorter ones. AntiGravityGear sells a lot of different gear, from tarps over stoves and cookware to cozies and stuff sacks. Can you tell us a little bit about the beginnings of AntiGravityGear, the birth of your product lines, and how it developed over time? My youngest son and I were hiking on the Appalachian Trail in 2002. On impulse, I purchased an alcohol stove from Mountain Crossings Outfitter at Neels Gap and was absolutely fascinated. We probably burned that thing 4 or 5 times a day on that hike finding any excuse to fire it up just to watch it work. It was so light and powerful. When we got back from the hike, I started making stoves and experimented with jet size, placement, stove height and any number of other things to find the ‘sweet spot’ of efficiency. Before I knew it I had made over 50 stoves before settling on a configuration. I then made the tooling to produce them consistently. The Tin Man stove of today is identical to ones I made in 2002. My son’s Boy Scout Troop needed money to purchase backpacking and camping equipment so I started selling the stoves on eBay. As sales increased, a crude website went up and I took on the name of AntiGravityGear. Along the way, I found some material in the local hardware store that was extremely light weight and thought it would make a good insulator for my cooking pot. I was tired of my food cooling down before the third bite so made a few pot cozies. About that time, there was an article about alcohol stoves in Backpacker Magazine and I decided to send one in to the gear editor because I thought mine was superior to the ones I read about. There was extra room in the shipping box so in went a pot cozy. They were not at all interested in the alcohol stove but really loved the pot cozy. Next thing I knew they had awarded the Editors’ Choice Award of 2003 to AGG for the pot cozy and that was when the company really took off. We now make pot cozies for over 50 stock pots and make custome cozies as well. George, we love to be let in on the work-in-progress stuff! Can you let us know a tiny bit on what kind of new products we might be able to get in the future from AntiGravityGear? I am currently working on shelter designs and rain gear. My 10’ Basic Tarp is the main building block for my convertible shelter system. There will be a net tent released later this year that has a bathtub floor that mates up with the Tarp. This was one of the shelters I tested this past summer. The Poncho Villa rain poncho joins to the front of the Tarp to form a vestibule for an additional 17 square feet of shelter area. My rain jackets are popular and I will have some rain pants on the site soon. There are some other projects on the table just waiting for the time to develop them properly. I’ve just completed the Southern Mountains section of Pocket Profiles for the Appalachian Trail. This is an entirely new product that combines trail data, a map, and an elevation profile for specific sections of trail. Some hikers on the AT eventually cut the elevation profile off their large maps and just hike with that. We combined the elevation data with trail information, resupply points and town information to make a great hiking tool. They weigh about 4 grams each and are printed on an almost bulletproof, waterproof plastic. Pocket Profiles are in the works for other trails as well. 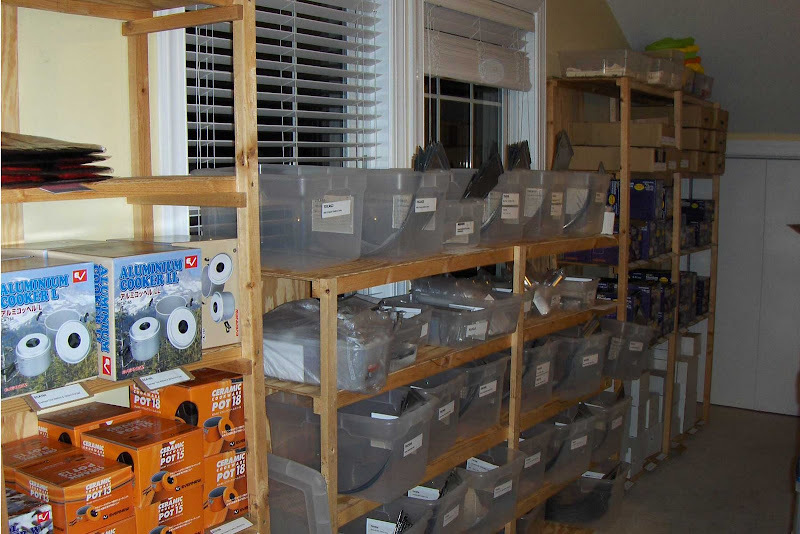 Part of the AntiGravityGear stock room. How works the R&D at AntiGravityGear, do you have a need yourself that you try to fix, or do some of your clients inspire you for new products or ask you for solutions to their problems? Both methods, really. I like to find a need and fill it and solve problems for customers. I have the best customers in the world and they are constantly providing feedback that helps in product improvement or results in new product development. What is the most sold piece of gear from AntiGravityGear? Also, where do your customer come from? We sell a lot of pot cozies, alcohol stoves, Caldera Cones, Tyvek, Tree Lines, Water Bags and stuff sacks. Our rain jackets are starting to sell a good bit too. Our customers are from around the world but most are from the USA. We also sell to backpackers in the UK, Germany, Japan and Australia. We know that you are cooperating "behind the scenes" with the guys from Trail Designs, but are there other cottage manufacturers with whom you are in touch? Yes. In addition to Trail Designs, we have always had a close working relationship with Enertia Trail Foods. They make the best tasting dehydrated backpacking meals on the market in my opinion. We have tested food for them and make a pouch cozy for them that fits their meal bags. They have a lot of exciting ideas and new meals coming out this year and are a company to be watched. Most of the manufacturers in the light weight gear business keep in touch with each other because our paths often cross at shows and hiker gatherings. The industry really is a loose-knit family and we often refer customers to each other if a need can be better served by a competitor’s product. My favorite backpack is a pack called the Northern Light made by Elemental Horizons. Matthew Lagas-Rivera makes the most comfortable sub 3 pound pack I’ve ever carried. I argued with him at length when he was developing the pack about making it lighter for the 15 to 20 pound load range. But he wanted to fit the broader market of 30 to 35 pound range. Fortunately I lost the argument. The result was a pack that weighed in at 2 pounds and 5 ounces and yet was incredibly comfortable when carrying 30 plus pound loads. I don’t like to carry that much weight but it’s nice to have that capability when you have an 8 to 10 day un-resupplied section of trail to cover. I use either a Western Mountaineering Mega Lite down sleeping bag, or down quilt or down sleeping bag I made along with a pad from Gossamer Gear. My shelter of choice is the AGG 10’ Basic Tarp with vestibule at 15 ounces. When and where was your last longer backpacking trip, and what was your baseweight? Are you planning to get out for a trip soon, and enjoy the winter season in North Carolina? My last long hike was a 10 day hike in Montana’s Bob Marshall wilderness. The spring hiking season is starting and business will probably not allow me to hike much before summer. We are thinking about the Wind River Range, the Sierras, back to New Mexico. We shall see. I think the ultralight segment of backpacking will remain fairly small. Ultra light gear is generally less rugged and sometimes not as convenient to use so most of the weekend warrior types of backpackers are content to get their loads into the 30 – 35 pound range and keep them there. The more serious backpackers will always be trying to shave a gram here or there but represent a smaller group. George and his associate Matthew testing gear in Yosemite above Nevada Falls. George, I thank you for taking the time to answer my questions. Is there something you would like to add? Absolutely. When seeking new gear don’t just go to the big-box type stores. Take the time to search out the small specialty manufacturers when seeking new gear. They are the tip-of-the-spear in gear innovation and are run by people who actually hike and have a burning passion for what they are doing. Trail Designs, Gossamer Gear, Enertia Trail Foods, Six-Moon, Jack-R-Better, Speer Hammocks, ULA, are just a few of the smaller customer service oriented shops that immediately come to mind but there are many more. So much gear, so many trails, so little time!